Comandon Cognac "Very Special" (VS) is a harmonious blend of some fourty eaux-de-vie from the best terroirs of the Cognac region selected for character and softness. It is aged for between 4 and 8 years in red Limousin oak casks that enhance our cognacs with subtle aromas. 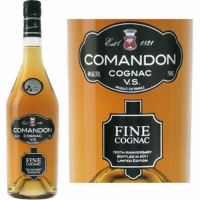 The result of this superior blend is an exceptionally fine and smooth cognac VS. The bouquet is complex for a young cognac with elegant and delicate shades of vanilla and honey. Rancio shades appear during aeration with young and bright fruit and flowers; nose mixes young, very ripe clean, smooth, very well balanced, with no acidity and tannic "grip", very easy-to-drink and lasting flavors. The color is a light, brilliant, golden yellow. Comandon VS has a clean vanilla bouquet, with overtones of wild roses and dried apricot. Its taste is fruity and light on the palate, with excellent flavors that lingers in the mouth for about 5 minutes.